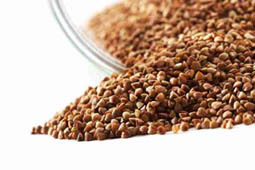 Buckwheat diet heavy enough, but effective: enables to loose 5-10 kg for one week. All that is necessary is the especial prepared buckwheat all the week long. To fill in with abrupt boiled water buckwheat grain and to allow to be insisted within 12 hours. After that the buckwheat is ready to the use. Any spices and salt. The diet lasts one week then it is necessary to make a break at least 1 month. After end of a diet, it is necessary to eat moderately to not collect the weight again. Try to make the diet after a diet as much as possible healthy . Recommendations on a buckwheat diet. It is possible to wash down a buckwheat 1% s' fat yoghutr or water. In day it is impossible to drink more than 1 liter of yoghurt, but the buckwheat and water can be used unlimited. An interval between reception of food and a dream should be not less than 4 hours. It is possible to add the moderate quantity of fruit, or 20-30 grams of yoghurt.